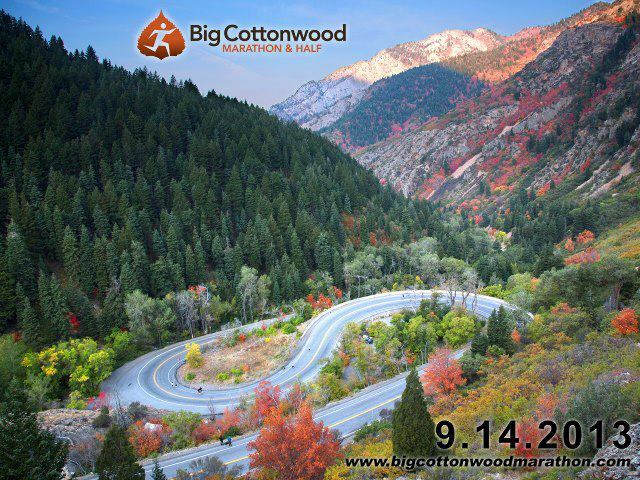 Week number 11 of our Big Cottonwood Marathon cycle was entered into the books with a 21-mile long run to cap off a 71-mile week – only the 6th time we’ve ever run that much in a single week and only 4 miles short of our most volume ever preparing for the marathon that wasn’t – Boston 2012. I remember those previous 70+ mile weeks when the final miles on Sunday were a struggle. I felt like I was pushing right up until the end and while the volume was significant – I was also running them in February and March, not July and August here in Texas. 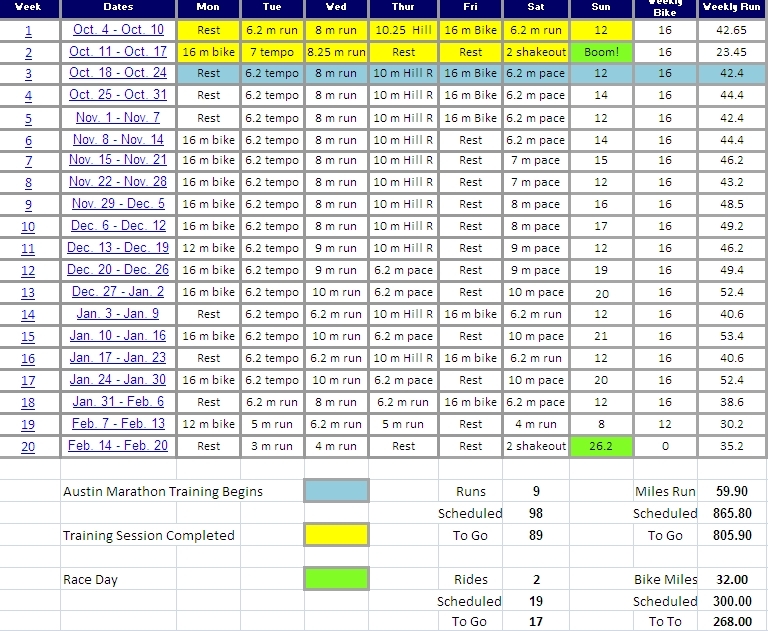 Back in 2011 training for New York City we did train through a Texas summer but we were peaking between 62-65 miles. Sunday’s run – and I of course try to keep any individual workout in perspective – as taken alone and out of context – no single workout really means much of anything during a training cycle. They are akin to a spec of sand on an entire beach. But on Sunday coach assigned my “weekend workout” at the tail end of my long run, not on Saturday as we have been accustomed to in the past. The plan on Sunday called for 13 miles at MGP + :60 seconds – or 7:50 pace – our typical summer long run pace – and then at mile 13 shift gears and run the next 7 miles with 4:00 minute intervals at Goal Pace, alternating with 4:00 minutes at 7:35. At the end of those 7 miles, I would run whatever distance remained at an easy pace to reach 21 miles. I ran the hill route out of the neighborhood, then hit the Avery Ranch Golf Course for more hills and a return to the neighborhood for the first 13 miles. I took a quick sip of EFS on the front porch of the house and changed out of my soaked through running shorts into a new pair. My shoes were still in pretty good shape, so I decided to run the rest of the workout in the same socks and shoes. My heavy Brooks trainers. My 4:00 minute intervals came in at 6:51, 6:45, 6:43, 6:40, 6:39, 6:42, 6:50. Perfect. As I ran the last 8/10 of a mile I still felt very strong. My form was rock-solid. I felt like if I had to drop 5 more miles at 7:00 min./mile pace – I had that much left in me. All at the end of a tough week of training. Now again, not to make too much of any of this, other than the fact that the plan that Coach Carmen has put together for me this summer seems to be working. A good mixture of easy runs, long runs and strategic rest days mixed in with long intervals, repeats on the track and 5K-10K pace workouts to spend some time at Lactate Threshold pace. Paces that I rarely if ever ran during a marathon training cycle in the past. The payoff when we spoke about this approach 3 months ago was to make 6:50 pace seem much easier on race day. That if I could improve my running economy or “gas mileage”, I would have what it took to close out Cottonwood strong and run the final 10 kilometers of that race with my hair on fire if need be. Simply put. I feel like it is working. Never have I felt this strong, this ready, this early in a marathon cycle. Now it is a matter of not peaking too early, continuing to build week upon week and then when the taper arrives, sharpen my mental game so that there is not a sliver of doubt in my mind about going for it on September 14th. What struck me as memorable about that note is that yes, to me I feel much more focused this go round. More detached. More clinical in my approach. I have been keeping emotion and desire out of it thus far – as I know on race day I will be able to summon those feelings if I need them. All I ever have to do is to cast a passing glance at the initials D.V.D. and numbers 8-15-10 on my race flats to tap into those reserves. But for my friend Jim to remark that even he can notice the difference this time all the way from Wells, ME – than surely there is something different going on. That was the whole point in working with Coach this training cycle. I feel as if I took myself about as far as I could by myself. It was time to shake things up. Move out of my comfort zone. Train differently. Commit to each workout and execute. Emotionless. Detached. Focused. Some runners believe that on race day they can surpass what they have shown while training. That it is all supposed to magically come together when the lights go on and the stage is lit. For some of them it works. But when it comes to the marathon, the truth of the matter is I have pretty much run the races I was supposed to run with a couple of bad breaks thrown in with race day weather. If that holds true this time – I’ll take it. The race I am supposed to run on September 14th, the one that I am prepared to run – the one that I am ready to run will allow me to reach my full potential. In the end that is all any of us can hope to get out of the sport. We’ve got quite a bit more pounds of sweat and effort to pour onto the road, track and trail over the next 9 weeks. That’s fine, all part of the price of admission. As I pulled up at the end of 10 hot, humid, steamy miles this morning and picked up my water bottle from the driveway I found myself at the middle of our preparation for Cottonwood. 56 workouts in the book, 56 workouts to go. 561.40 miles complete. 560.92 remain. What started out as a daunting 20-week, 112 run, 1,148.50 mile march to the finish line on race day is now down to a much more manageable chunk. Just 7 more Wednesday Track workouts with the group before the taper, just 5 more long runs in excess of 20 miles. While there is still a lot of work to do and certainly there are some tough workouts and miles in our future – especially this time of year in Texas – I can start to see the faintest outline of the end to all of this on the horizon. In some ways there is satisfaction in getting to this point. I think that so far I have done a good job of monitoring my workload, adding to the base carefully, pushing hard on the hard days and running easy on the easy days as I remember all to well just how fit we were prior to the Houston Marathon and with just 4 weeks to go until race day, we suffered an injury and had to pull out of the event. I won’t be able to relax until I come through that first taper week long run of 16 miles healthy – knowing full well all the heavy lifting is done and the only thing that can trip us up at that point is bad luck. We are due for some good luck this time. But while it is easy to look back at what we’ve accomplished so far, I know that I am still no ready for where we hope to go on race day. This morning in a moment of weakness I strayed from the planned workout for the first time in 56 runs. Instead of running an “easy 10” meaning 10 miles all around 7:50 to 7:55 pace – or Marathon Goal Pace + :60 seconds I found myself frustrated at the pace during the fifth mile. 77 degrees, 86% humidity I was already soaked to the bone, my shoes and socks squishing on the trail filled with sweat and I wanted the run to be over with. So I made a quick decision to drop pace by :10 per mile every mile over the last 5 to end around 7:10 pace. This would distract me a bit as I would no longer be counting each mile as it ticked slowly by, but I could think about pace and effort, gradually running harder and harder through to the end of the workout. The final 5 miles had assigned goals of 7:50, 7:40, 7:30, 7:20, 7:10. I ran them in 7:50, 7:40, 7:26, 7:17, 7:01. The “old me” would have felt good about the workout and that I worked harder than planned, which is a good thing. Marathon training isn’t supposed to be easy – those quicker miles would pay off on race day. But now I know better. There was absolutely no reason to run any faster than 7:50-7:55 on Tuesday morning as now my Track Workout on Wednesday is going to force me to exert more “effort” to hit the assigned paces that Coach will prescribe than if I had stuck to the plan and ran easier. So for this Tuesday I let my mind wander and I lost sight of the big picture for the first time in 11 weeks and 56 workouts. Up until that point I had exercised a great deal of patience and focus. Then I grew tired, frustrated and deviated from the plan. If I make that same mistake on race day in Utah, lady Marathon is going to rise up and squash me like a bug. She will show me absolutely no mercy and will punish me for deviating from the plan ever so slightly. I know this and still, I did it anyway. 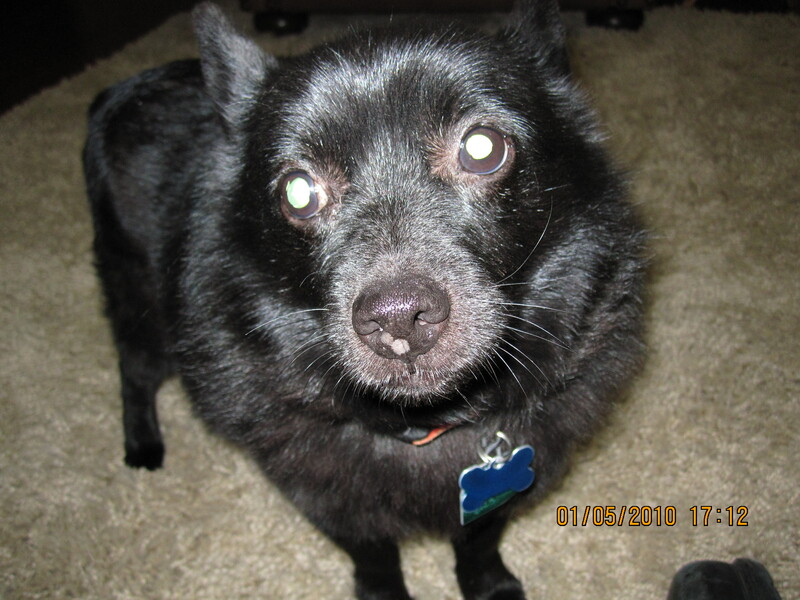 I have felt guilty all morning and know that I must do better. I will do better. This one slip-up cannot become a habit or I am going to pay the price on race day with a flat performance or a poorly executed race plan. So tomorrow we get back on the horse and will run the precise workout that Coach assigns. No slower, no faster and do the same thing 55 more times in a row until race day. Sometimes I wonder how many times I am going to have to be taught the same lesson over and over again before I get it. To quote Red Foreman from That 70’s Show – “Dumbass”. Time for me to get my act together.